Alarmed by a changing climate and eager to tell stories, photographers, painters, songwriters and others go north. They go to bear witness, document change and tell stories. 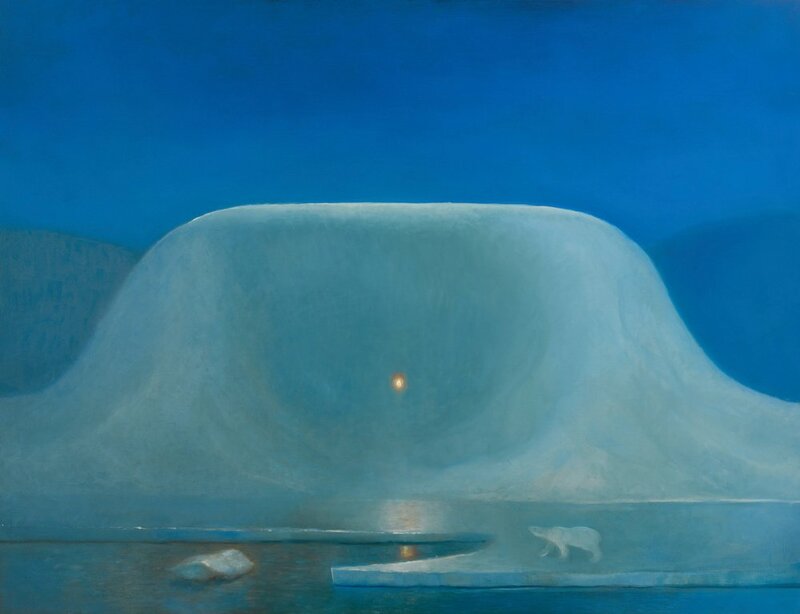 Driven by a sense of urgency, artists are following in the tradition of Rockwell Kent and going to the Arctic to capture the majesty of the icebergs, the mystery of the landscape and the daily drama of a culture and way of life that feels out of place in a modern world. Others go for political and cultural reasons, to show the world what climate change looks like in its northernmost reaches. WHEN: Opens Aug. 18 with reception from 5 to 7 p.m.; fall hours vary, check website for updates. And others just go — for the beauty, the adventure and the opportunity to see something new. White is among dozens of artists from Maine who are going north with increasing regularity to explore a new frontier that has become accessible through artist fellowships, residencies and a surge in ecotourism. As artists document their experiences in places worthy of exploration because of their beauty and the peril they face, their work from the Arctic is showing up in exhibitions across Maine, in photographs, paintings and film. White is the most immediate example. She and Young are showing work together at the Tides’ North Church exhibition space, culled from their joint journey to Prince William Sound, Alaska, and separate residencies that each completed through the Arctic Circle artist and scientist residency program, which has sent several Maine artists into the Arctic in recent years. 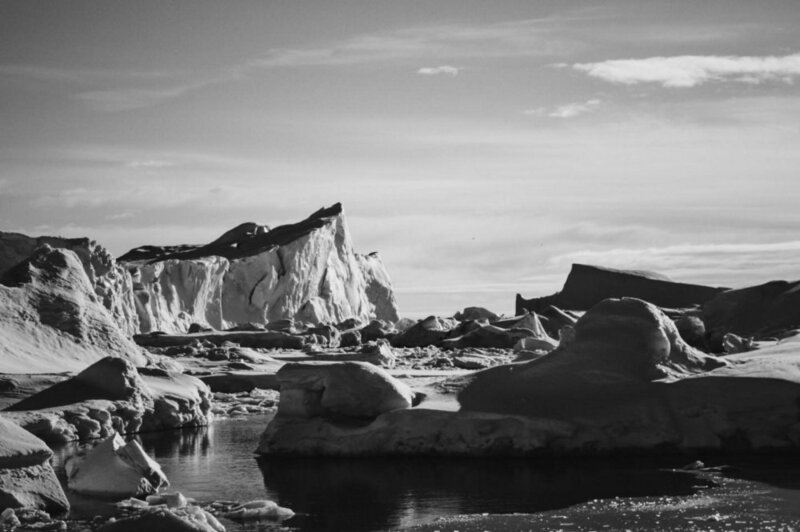 With “Forecast,” their work at Eastport considers receding glaciers, the transformative nature of ice and water and their relationship to the land. White is showing photographs, a video piece and a handful of smaller works from her series “Temporary Ground.” Young has a hanging installation as well as smaller sculptural pieces. 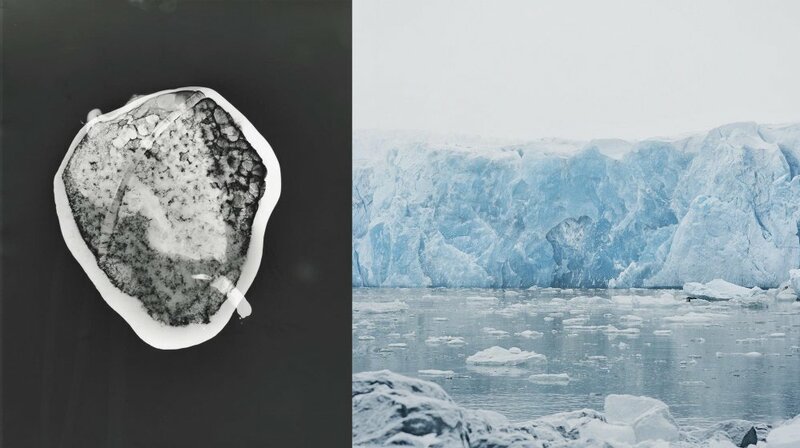 White also has begun a street-art initiative called “Chattermark” that involves large-scale photographs taken in Svalbard, Norway, and photograms, a camera-less contact print process, created in a temporary darkroom in Alaska from bits of receding and melting ice, calved from glaciers and floating in the sound. Printed on paper, each image is 8 feet square, and they will hang side-by-side to create a 16-foot mural. White adheres them to buildings with wheat paste, which wears down with time and weather. The images are meant to disintegrate. Paid for with a grant from the Kindling Fund administered by Space Gallery in Portland, “Chattermark” is meant to insert images of the polar landscape into the daily lives of Mainers. It takes its name from the term that describes the grooves and gouges made from glaciers dragging boulders and debris. 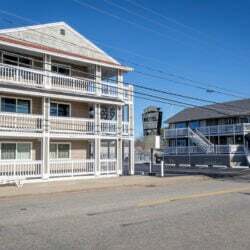 White installed images from “Chattermark” on the exterior of the Tides building in Eastport last week and will install another in Farmington in September. 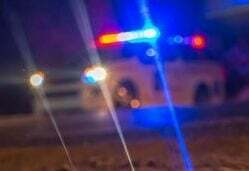 This fall, she will add them in Orono, Portland, Rockland and other communities. She won’t say exactly where they will be, because she wants to surprise people with them. 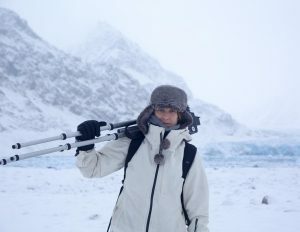 White’s interest in the Arctic began in 2012, when she completed a residency on Grand Manan Island in the Bay of Fundy. She went to the Canadian island expecting to work on a series about the sea and the interconnections among oceans. While there, she observed that the island’s herring fishing tradition had diminished, and people complained of the heat. “Everyone said it was the hottest summer ever, and the ocean was changing for sure. It wasn’t clear to me if it was climate change or over-fishing, but on this island that was peppered with fishing weirs there were no nets and no fish,” she said. 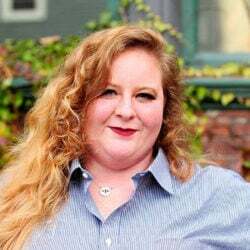 She did her Arctic Circle residency in 2015 and worked in Alaska last year. White’s work explores environmental concerns and involves scientific tools, including microscopes, magnetics and roots scanners. The environment and the intersection of art and science have become recurring themes. She calls climate change “the most urgent situation of our time, impacting basically everything from weather to war, which is a definite draw for the work.” But she does not intend her work to be preachy or political or to create panic. 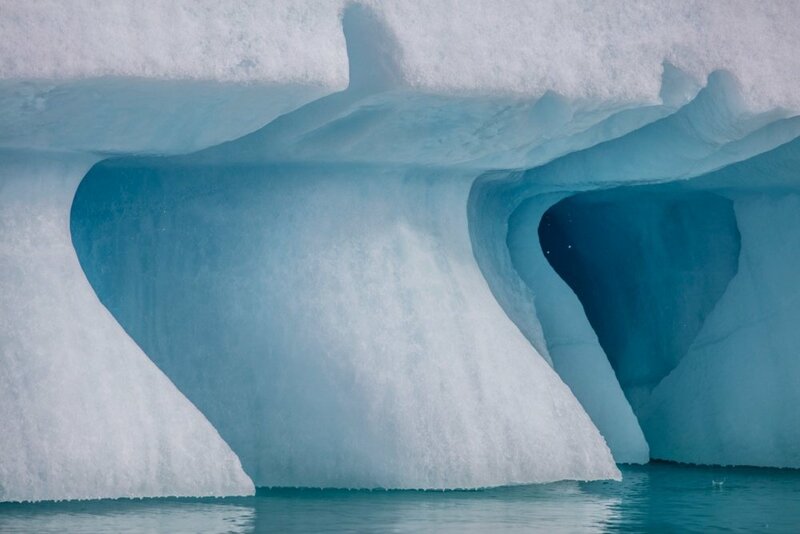 “I’m drawn to the beauty of the ice and the extreme landscape and want to get closer to the history of our planet and to try to understand how we can be part of nature but so disconnected from it,” she said. 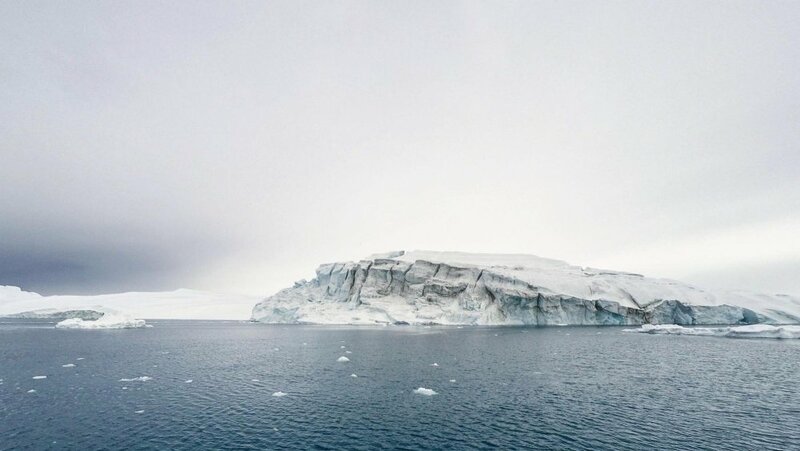 The content of her work – climate, environment, science, ice, water, nature – and her approach – abstraction and documentation – are folded into her overall practice, which relates to unknowns and uncertainties, as well as the connection and disconnection that humans have with the world around them. At the Maine Boats, Homes and Harbor show in Rockland, which concludes Sunday, Portland photographer Justin Levesque is showing photos from his experience aboard an Eimskip container ship in fall 2015, when he traveled from Portland to Newfoundland to Iceland. It’s the same body of work that he exhibited at Congress Square in Portland last year. As he did in Portland, Levesque is showing the work in Rockland inside a 40-foot shipping container. Patrick Arnold, president of Soli DG Inc., a Portland consulting firm that specializes in international trade, helped organize the Rockland exhibition and hopes to keep the shipping container in Rockland and rotate art by Levesque and other artists who have made the Eimskip passage from Portland. So far, six artists have made the journey in three years, Arnold said. The informal residency program is part of Soli DG’s larger Skald and the Sea initiative that aims to preserve the stories of the sea in the form of contemporary artwork. In the Viking age, poets and storytellers were called skalds. As a company, Eimskip has a long tradition of supporting artists, Arnold said. When it carried passengers, Eimskip offered free passage to America for Icelandic artists in return for a painting. The company built a deep art collection, which is on view at its headquarters in Iceland. The company’s willingness to accommodate artists is part of its art tradition, Arnold said. Part of his job is making the collaborations happen by connecting artists with Eimskip and creating outlets for exhibitions. The most recent artist to make the trip was a musician, Connor Garvey, who lives in Portland. Garvey wrote songs while underway and collaborated with an Icelandic musician on the other end. If the collaboration works out, Patrick wants to record the musicians in Maine and have them premiere their songs at the Sunanna art and cultural festival at Thompson’s Point in March. The festival, which began this year, celebrates the role of Portland and Maine in North Atlantic commerce and the economic and cultural ties between Maine and Iceland. It’s important to send artists into the Arctic, he said, because they can tell a story in different ways than scientists or the media, he said. “The newspaper clippings won’t last as long as the art,” he said. Anneli Skaar of Camden, a first-generation immigrant from Norway, was drawn home to paint deep, stark and hauntingly beautiful images of her native landscape. 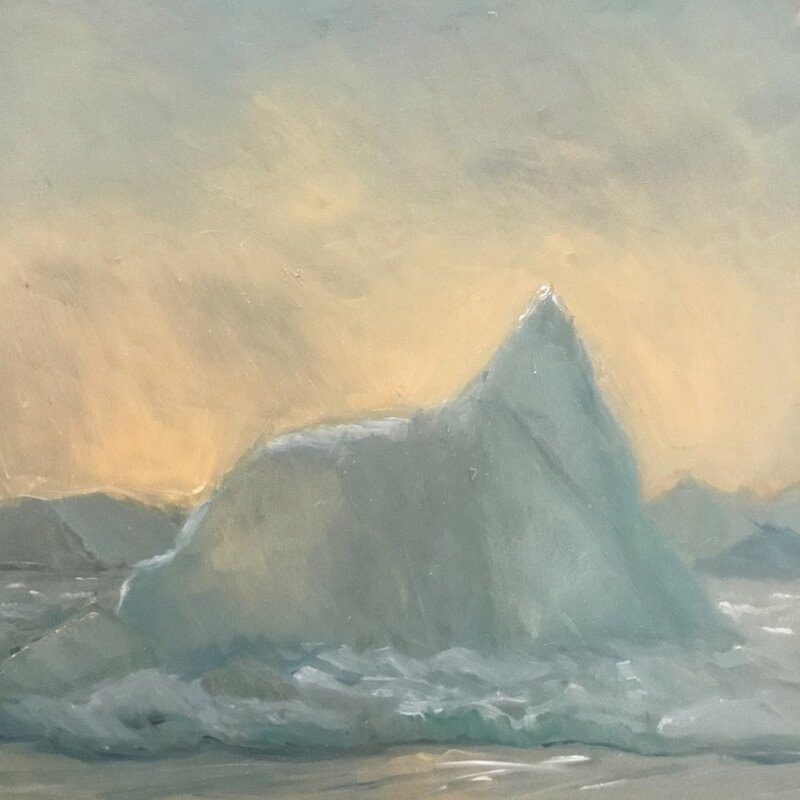 Before she became creative director at the Farnsworth Art Museum in Rockland, Skaar completed an artist residency in Svalbard, an archipelago in the far north of Norway in the Arctic Ocean, roughly midway between continental Norway and the North Pole. It’s more than 3,000 miles from Portland. “I went in February, and it was this beautiful light, this gorgeous blue light. I fell in love with the colors and the shapes,” she said. She’s been back to the Arctic twice since. She hitched a nine-day ride on an Eimskip container ship in February 2016 and painted in Greenland in the spring. She is going back to Norway in November. On her Eimskip trip, Skaar was joined by Jonathan Laurence, a multimedia artist, also from Camden. He teaches photography and book design workshops in Norway and worked with the Maine International Trade Council as its social media guru when it hosted the Arctic Council’s Senior Arctic Officials meeting last fall in Portland. He’s been to Greenland and Iceland and is setting up a return trip to Iceland in December. He will teach again in Norway in January. Levesque made a second trip to the Arctic this spring, aboard a sailing vessel. It was a dramatically different experience than his journey aboard the container ship. The Eimskip trip was about the intersection of art and commerce and Portland’s evolution as an international marine terminal. He was interested in the stories of the ships’s crew as much as he was the Arctic environment. 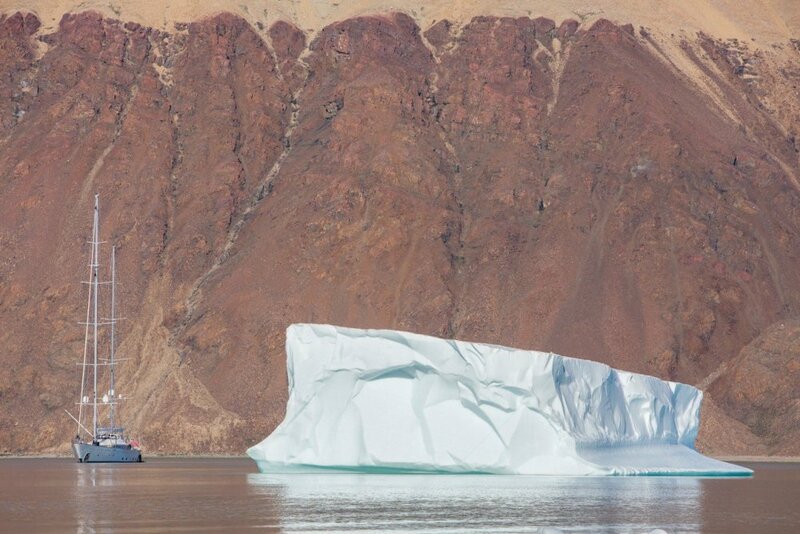 Peter Ralston, a photographer from Rockport and co-founder of the Island Institute, sailed to Greenland and through parts of the Northwest Passage last summer aboard a private yacht. He went with a purpose and came home with a clear agenda to talk about climate change. He’s touring a slide show and talk, “Arctic Observations,” that draws parallels to what’s happening up north and what’s happening in the Gulf of Maine with a changing ecosystem and rising water levels. He’s also interested in climate change and understands the allure of sharing anecdotes to the tell the story about what’s happening with the climate and the changing landscape. But he thinks scientists tell the climate change story more effectively. “I defer to the scientists in terms of the data, and I think it’s important to listen to the generations of scientists who have accumulated data. 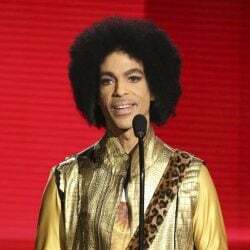 The data is sobering,” he said. As an artist, his job is to show the beauty to create context for a larger conversation.